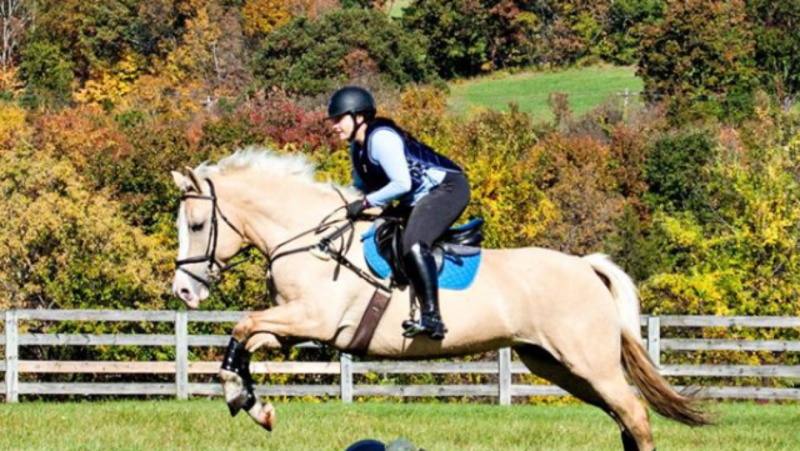 Can I start by saying that a horse trial held in mid-August should not be called a “Fall” mini trial? Until the weather is cool and breezy and leaves start to depart from trees, it is summer in my book, and the sweaty horses this weekend is a testament to that. Let’s back up though. My day actually started closer to 6AM (before the heat but right within prime fog time in KY). The sun wasn’t up yet, but there was a slight glow to the sky that let you know it was trying. What was I doing at this time? I was climbing through some overgrown and wet weeds in May’s field, trying to make sure I didn’t fall on my face while trying to find her. Luckily, she was hanging out by the shelter and let me catch her. She had even stayed mostly clean from the night before. Good mare! We loaded up the horses around 7AM, since our first rider had an 8:17AM ride time… My ride time was 11AM, but it was well worth getting up early to be a part of a big team again. I forgot how much of what I love about showing is about the people I show with. Anyway, May got off the trailer more relaxed then she has ever been off property, and this is saying something. Husband of the year decade lifetime held May while she cocked a foot and took a nap. Cool. I tacked up, swapped into my white pants, and hopped on for a quick warm-up before Dressage. Now, Dressage immediately had a couple of challenges for us. The warm up area was right next to the start box for XC, and it was on the other side of the property from our actual show ring. Also, the show ring was in the facility’s indoor arena. We have never done Dressage indoors, AND it is one of those indoors with an entrance on the side to the barn and stalls partially open to the indoor (with horses in them). So there it is. There is a lot I can say about it, but I’ll give you all the scores and judges comments, then my own. 1. Enter Working Trot Rising. Halt through Medium Walk. Salute – Proceed Working Trot Rising. Judge: Forward and Square. A little crooked after. Judge: Could Show More Bend. shoulder through the turn, and I should’ve taken the opportunity in the corner to really lift her and shove her over. Me: Ok. Yes. The tempo was steady, but she was so far away from my outside rein that it was a bit like driving a tractor trailer with the steering wheel on the floor. 4. Circle right 20 meters developing working canter in first quarter of circle, right lead. Before A – Working trot rising. Me: This is a hard movement for me to review because the transitions get their own score. Also weird. No thoughts. It was fine but not nearly as good as I know she can be. 5. Transitions in and out of canter. Judge: 1st could be more responsive. 2nd – Smooth. Me: Totally agree. The downward transition wasn’t WONDERFUL, but we got the tempo back within the confines of that movement. (i.e. before A). Me: I like straight lines like this. I can open her up a bit and show her off. She was really good here, and we could show off a working trot. Me: Yup. Not as steady in the contact as I would like, but the rhythm and relaxation were there. Again, that became the aim after we decided that the indoor was not our happy place. 8. Circle left 20 meters developing working canter in first quarter of circle, left lead. Before A – Working trot rising. 9. Transitions in and out of canter. Judge: 1st Smooth. 2nd could be more prepped. Me: I am pretty meh about both transitions. I would’ve given me a 6 because I really needed a half halt before both. Judge: Smooth transition. Could be more active. Judge: Better Activity. Clear Stretch. Difference Shown. Me: See? Boring walk paid off. May’s conformation just makes this movement a bit hard for her, but I think that this time, she clearly showed a stretch over her top-line and an opening of her stride. Me: Yup. This is kind of an odd movement to score. It is trotting around half the arena. 13. Down Centerline. Halt through medium walk. Salute. Me: Same. Appropriate for the level. Although – Am I horribly leaning to the right? This video makes it look that way. I need to watch my mirrors/set up my camera at home to see if this is a habit. Collective Marks: (nothing was underlined or circled). Judge: Cute! Pair works fairly well together. Forward thinker. Watch he doesn’t get too fast. Canter transition could show more prep/polish. Me: Agreed. I don’t think speed is an issue as much as balance. Final score: 29 to put us in third out of SEVENTEEN. oh man, intro C is NOT my favorite test haha, esp for lumbering freight train charlie lol. you guys look great tho, and such nice scores! congrats on getting off to a great start!!! I did not enjoy it at all hahaha. I would have much rather done BN A. Good job! Doing dressage indoors unsettles me too, I don’t blame horses for being weirded out. Intro C suuuucks and I hope it gets a major revamp at the next update. It is AWFUL. I have never ridden it before and just BLARGH. The canter work is so hard hahaha. Like where else are you expected to do 3 strides of canter? great job. UGH i hate intro c. 🙂 Way to make it through 🙂 And in a spooky indoor no less! You two look really good. Nice and relaxed and focused. I hope the rest of the day went as well for you! Thank you! I was really proud of her for staying relaxed, even in the walk work. Am I the only one that really enjoys watching her big blonde booty going badunkadunkdunk up centerline? Please do a freestyle to Missy Elliot’s Work It someday. GREAT job! Love it! Intro C certainly doesn’t seem to flow too well, but I think you two did well. Congrats on a 29, and in an uncertain indoor arena too! It certainly was disconcerting even for me and I wasn’t riding in it. I can’t wait to watch/read about the rest! Thanks! It was one of those rides where I just did what I could and had to really limit where we “showed off”. That’s a pretty great score and placing! Intro C is totally the worst. Like shortening the time you get to do canter does not make it easier, mmkay? Right! A horse that is unbalanced through the transition will not be able to get balances again in 2 strides to do the downward transition…. so silly! Haha, fall in August…uhhh wut? Great job surviving the indoor! Watching May do her thing just makes me smile….you could fit all I know about dressage on the head of a pin, but she has such a willingness and good humour to her that I think ought to get you extra points. Glad you enjoyed it! The test is SUPER odd to ride. Most Dressage riders I know skip Intro C when they start going up the levels. That’s an awesome score – how fantastic! Lovely flowing test. 3rd out of 17 is awesome, way to go!! !